The Shuaiba plant will deliver 250,000 cu m of water per day. 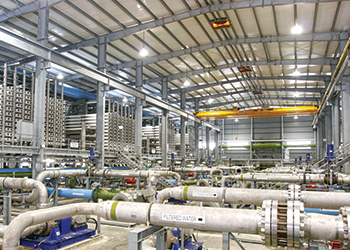 Located in the Shuaiba area on the western coast of Saudi Arabia, the plant will use reverse osmosis technology to deliver up to 250,000 cu m of water per day, supplying potable water to more than one million residents in the cities of Makkah, Jeddah and Taif. As part of a joint venture in which it holds 50 per cent stake, Fisia Italimpianti has signed a limited notice to proceed (LNTP) with Acwa Power to start the preparatory work, said Salini Impregilo. The joint venture expects the signing of a full notice to proceed (FNTP) by July 27 and to hand over the plant by May 2019. This new order confirms Genoa-based Fisia Italimpianti as one of the world’s leading builders of large desalination plants, with more than 4 million cu m per day of installed capacity and one of the few able to deploy the two prevailing technologies used in the sector: thermal and reverse osmosis, it added.